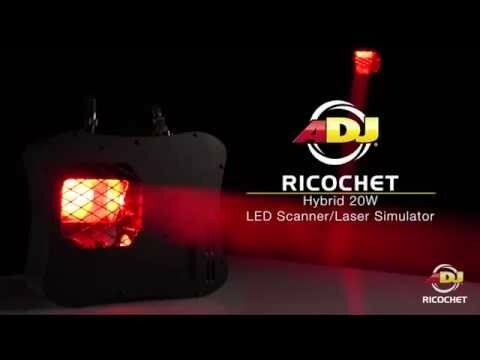 The ADJ Ricochet is a high-energy hybrid 20W LED Scanner / Laser simulator. Its precision steeper motors and dual mirrors create pure lighting excitement with beam, cones and wave style effects that cover a large area. 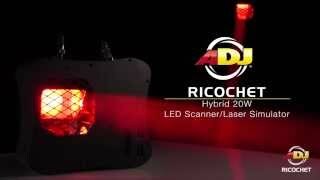 Considering purchasing the American DJ Ricochet? Have questions? Ask people who've recently bought one. Do you own the American DJ Ricochet? Why not write a review based on your experience with it. This light is amazing, It's bright, well built and the shows look good. I bought 2 because they work so well together. However i gave them 4 stars because on sound mode they don't do as much. Seen a video for American DJ Ricochet online or have you own video? Check out American DJ Ricochet on DJkit.com!